Shape memory properties of thermally responsive polymeric materials are due mainly to a phase transition from the rubbery phase above the transition temperature (glass transition or melting temperature) to the glassy or semicrystalline phase below this temperature. Within constitutive models of shape memory polymers (SMPs), this phase transition is mathematically accounted for by the frozen volume fraction for which a suitable evolution law must be postulated or derived. In this paper, the evolution laws that have been proposed in the literature are examined both from the experimental and from the theoretical point of view. 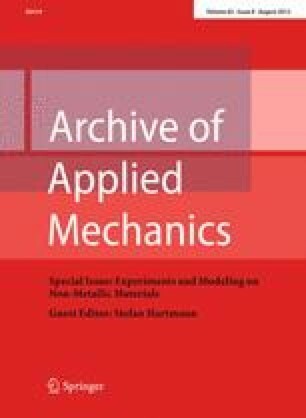 It is found that the predictive capabilities of the phenomenological laws may be improved by admitting involved material constants to depend on parameters such as pre-strain, rate of heating and cooling, and other quantities characterizing thermomechanical cyclic tests. It is next shown that for a wide class of linear constitutive models of SMPs, the evolution law for the frozen volume fraction may be derived in a systematic way from strain and stress profiles experimentally obtained in the standard thermomechanical test.